“And when He had spoken this, He said to him, ‘Follow Me’ ” (John 21:19). Three years earlier Jesus had said, “Follow Me” (Matthew 4:19), and Peter followed with no hesitation. The irresistible attraction of Jesus was upon him and he did not need the Holy Spirit to help him do it. Later he came to the place where he denied Jesus, and his heart broke. Then he received the Holy Spirit and Jesus said again, “Follow Me” (John 21:19). Now no one is in front of Peter except the Lord Jesus Christ. The first “Follow Me” was nothing mysterious; it was an external following. Jesus is now asking for an internal sacrifice and yielding (see John 21:18). Between these two times Peter denied Jesus with oaths and curses (see Matthew 26:69-75). But then he came completely to the end of himself and all of his self-sufficiency. There was no part of himself he would ever rely on again. In his state of destitution, he was finally ready to receive all that the risen Lord had for him. “…He breathed on them, and said to them, ‘Receive the Holy Spirit’ ” (John 20:22). No matter what changes God has performed in you, never rely on them. Build only on a Person, the Lord Jesus Christ, and on the Spirit He gives. All our promises and resolutions end in denial because we have no power to accomplish them. When we come to the end of ourselves, not just mentally but completely, we are able to “receive the Holy Spirit.” “Receive the Holy Spirit” — the idea is that of invasion. There is now only One who directs the course of your life, the Lord Jesus Christ. The real exodus location has been found. 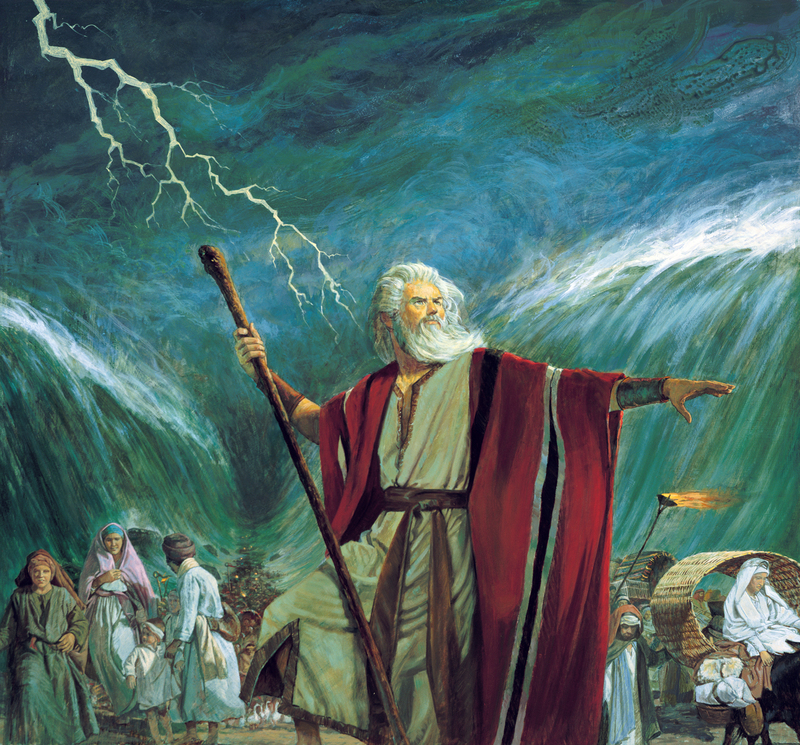 Did the Red Sea crossing in Exodus happen and if so where is the evidence? This episode is packed full of evidence from photographs to video footage of the actual location of this historical event. Why are we surprised by failure in the body of Christ? My friend sat across the table, picking at her burger and sweet potato fries. Over the months previous, she’d shared her story of encounters with churches and Christians—a story of immense pain, damage, and disillusionment. Thankfully, she could point to encounters of genuine love, but she’d endured more rejection than any human ever should. Most disturbing was how many of the wrongs enacted against her were done (supposedly) in Jesus’ name. I tried, clumsily, to join in her sorrow, to repent on behalf of the church that had failed her, to illuminate the true heart of Jesus: the Healer who’d rather die than abandon us. But I didn’t know what to say, given her many scars and her layered trauma. So there we sat, pretending we cared about our lunch as we waded into the darkest waters of the soul. “Yes, I think that’s where we are,” I answered. I was not surprised by her stiff-arm. Over our months together, I noticed how whenever our conversations moved to a place where she would need to trust God or take a risk to step deeper into relationships, she withdrew. That terrain was too dangerous for her wounded heart. I watched her sabotage friendships and go AWOL whenever she flirted at the edges of joy or hope. I felt her defenses kick in, as she’d turn cynical or aloof. She thought she might believe in God, but she balked at Christian community. It’s terrifying to let yourself be vulnerable again. I’ve had similar versions of this conversation numerous times, though rarely have they been this intense. With each year’s demographic reports, we hear how people are exiting religious communities at a rapid clip. Curiosity around general “spirituality” is on the rise, but fewer and fewer people have any interest in belonging to actual churches. While our current obsession with individualism and consumerism are certainly at play, along with our aversion to any restrictions on self-expression, our reticence concerning concrete religious commitments also reveals genuine pain. If we listen well to people’s stories, we’ll hear of authoritarianism and hypocrisy and massive failures, all enacted in our pews and pulpits. This is a truth we must own with broken hearts. We do not justify these wrongs. We don’t try to shift blame or explain anything away. Rather, we join our friends in their suffering. We drop to our knees and seek forgiveness. We ask God for mercy; we ask God to rescue us again and again. Though it grieves us, we really shouldn’t be surprised when the church broadcasts our idolatry, insincerity, or greed in Technicolor. The church, rather than a pristine place where good people demonstrate noble behavior, is the disfigured community where God gathers selfish, lustful, and power-crazed people who’ve grown desperate enough to desire His deliverance. The church is the place where our sinfulness comes out in the daylight, where neuroses reveal their sordid intensity—the space where we must grapple with the hundred ways we’ve failed to love. In the church, flooded with divine mercy, we learn that our malevolence and chaos may, bit by slow bit, be exposed and confronted by a God kind enough to receive our ugliness and strong enough to make us new. And here, immersed in the reality of God’s active mercy, we discover our scandalous hope. The church is not merely a human community, and we are not ultimately defined by our persistent faults or frailties. Rather, as a people whose life and existence emanates from Jesus, we are a divine community. God’s embodied presence in the world. This truth makes our transgressions all the more sorrowful. Often, we live as contradictions to who we truly are—a people who by the Holy Spirit participate in the resurrection as it breaks into our world. Who receive God’s life and then bear that life in the world. The church is glorious. And yet the church is a glorious mess. Our shock and indignation over the church’s misdeeds, real as they are, may reveal how profoundly we’ve misjudged our own failings and how deeply we’ve misunderstood the curative work Jesus does within His church. God is renewing us to health and life, but there’s a lot of muck and death to deal with before we get there. “Much anger towards the church and most disappointments in the church are because of failed expectations,” writes Eugene Peterson. “For as long as Jesus insists on calling sinners and not the righteous to repentance—and there is no indication as yet that he has changed his policy in that regard—churches are going to be an embarrassment to the fastidious and an affront to the upright.” Glorious mess indeed. I often hear people express desire for the church to return to the purity and simplicity of the first centuries. If only we could get back to when Christians were real Christians and the church was free of all of modernity’s evil temptations and entanglements. While I appreciate the aspiration for virtue, what church are we talking about, exactly? The early church where wealthy members exhibited rampant greed, feasting like kings while ignoring the hungry and poor (at the Lord’s Table, no less)? Where power struggles led the community into a fracas centered around personality and prestige (factions following Paul, factions following Apollos)? Where prominent members of the community lied and stole (Ananias and Sapphira)? Where members were promiscuous in ways that made even pagans blush (a man living with his father’s wife)? If we are unwilling to be part of any Jesus-community now, we certainly wouldn’t have been part of the church in Corinth, Galatia, or Colossae. The church has never been some nirvana of righteousness, but rather the tangible, immersed-in-the-wreckage people where God’s justice and renewal get worked out in real time. It’s the place where confession surfaces, where restitution happens, where we tell the truth about ourselves. The church provides the actual conditions, amid all our silliness and sinfulness, where we pray for God’s kingdom to come on earth as it is in heaven—because we know full well this isn’t our reality yet. The church is the place where we love one another enough to speak the gritty, unvarnished truth. It’s the community where we trust God’s mercy and keep showing up. Where we enact tenacious love and come alongside one another on the long road of following Jesus. The church has never been some nirvana of righteousness, but rather the tangible, immersed-in-the-wreckage people where God’s justice and renewal get worked out in real time. If we find ourselves overly distraught when the church reveals she is not an idyllic paragon of holiness, we’ve misunderstood Jesus’ ongoing work within this disappointing, rough-around-the-edges people whom He (remarkably) says are His body in the world. Our ideals of what the church should be often keep us from embracing the wonder of what she actually is: a motley assortment of bedraggled people who are finding ourselves undone and then remade by the Holy Spirit. In marriage, we don’t make a perfect match for our perfected self, but rather we submit to a lifetime of sacrifice and obedience, where we are shaped by God to become the kind of person who eventually practices the self-giving love Jesus makes possible. Marriage has a way of revealing our worst selves. I had no idea how selfish I was, how riddled with idolatry and self-protection, until I married. It’s astounding that my wife didn’t sprint the opposite direction instead of saying “I do.” By grace, however, marriage becomes the proving ground where God’s restoration actually happens. This is how the church works, too. We always join the wrong church. With the wrong people. All of us flailing like mad, making a shattered mess of things. And then God steps into our ruin and begins to craft beauty and wholeness out of the scattered shards. This is why, sitting across from my friend, I could invite her to trust God and to risk her heart with His people. It wasn’t because I had any confidence that she’d never be wounded (just the opposite, actually) but rather because I trust what God is up to among the people formed by His Spirit. I believed that if she would take that dangerous leap and risk opening her heart, she’d find genuine friendship that would meet her in her loneliness. She’d discover mercy from the very people who made her wary. She’d get irritated and angry (sometimes with good cause), even as she’d wrestle with her own issues and egotism on painful display. But she would find much goodness, too. She’d find God. She’d discover abundant mercy and welcome, glorious beauty, right in the middle of the mess. The church, despite our many deficiencies, offers hope drawn from a well far deeper than our own resources or best efforts. The church is not fundamentally what we are doing in the world but rather what God is doing. In Jesus, we discover the scandalous ways God moves directly into our troubles, and this is exactly what Jesus continues in the church now. The church can be the remarkable place where we relinquish our compulsion to hide our wayward hearts and our moral failures—where we drop our self-righteousness and name our fears, because we know that Jesus died on a cross and rose from the dead precisely because we require a healing that transforms us to the core. This mighty declaration of faith in the Creator of heaven and Earth was given by Jeremiah in respect to a mundane sort of need—the need of assurance that his real estate investment would be safe, even if he were forced to be away from it for many years. There is nothing too small for the Lord, just as there is nothing too hard for Him, and He delights to “shew himself strong in the behalf of them whose heart is perfect toward him” (2 Chronicles 16:9). Since God created all things, He certainly can control all things. If a person really believes the very first verse of the Bible—the simple declaration that the entire space/mass (energy)/ time universe had been called into existence by God—then he or she will never find it difficult to believe any of the other declarations or promises of His inspired Word. In response to Jeremiah’s great statement of faith, God gave him the assurance he sought: “Behold, I am the Lord, the God of all flesh: is there any thing too hard for me?” (Jeremiah 32:27). God, who made the sea, could roll back its waters to enable His people to pass through its very midst unharmed (Exodus 14:29); He who made the earth could cause the earth to cease its rotation to give His people victory (Joshua 10:12-14). There is nothing too hard for the God of creation! We respond: “No, Lord, please excuse me. That sounds like fanaticism—and I would have to give up some things!” So we refuse His desire, even though we want all the benefits of His cross. There is this thoughtful phrase in The Cloud of Unknowing: “He wills thou do but look on Him and let Him alone.” Let God alone. In other words, let Him work! Don’t stop Him. Don’t prevent Him from kindling your heart, from blessing you and leading you out of a common state into that of special longing after Him…. “Look on Him—and let Him work, let Him alone.” Get your hands down to your side and stop trying to tell God where to cut. Stop trying to make the diagnosis for God. Stop trying to tell God what to give you. He is the Physician! You are the patient…. Lord, I’ll try to stay out of Your way, take my hands off and let You work! Amen. Be ye therefore followers of God as dear children; and walk in love, as Christ also hath loved us, and hath given Himself for us an offering and a sacrifice to God.—Ephesians 5:1, 2. I know what God Himself must be. Either there is a God supremely good, One whom His children may love and trust to the very uttermost point without the slightest fear of the reality falling short of the heart’s desire, or else there is no God, no love, no forgiveness, no redress, God is wholly good, if good at all, and those who hope in Him will be wiser if they hope with all their hearts than if they hope with only half their hearts. As mighty and as wise as God is to save man, as willing He is. For Christ Himself is the ground of all the laws of Christian men; and He taught us to do good against evil. Here we may see that He is Himself this charity, and doth to us as He teacheth us to do: for He willeth that we be like Him in fulness of endless love. We know what God is like because we know the character of Jesus Christ. When called to serve or to suffer, we take stock of our strength, and we find it to be less than we thought, and less than we need. But let not our heart sink within us while we have such a word as this to fall back upon, for it guarantees us all that we can possibly need. God has strength omnipotent; that strength He can communicate to us; and His promise is that He will do so. He will be the food of our souls, and the health of our hearts; and thus He will give us strength. There is no telling how much power God can put into a man. When divine strength comes, human weakness is no more a hindrance.